I was in the newsroom when friends started sending me messages about the owl. 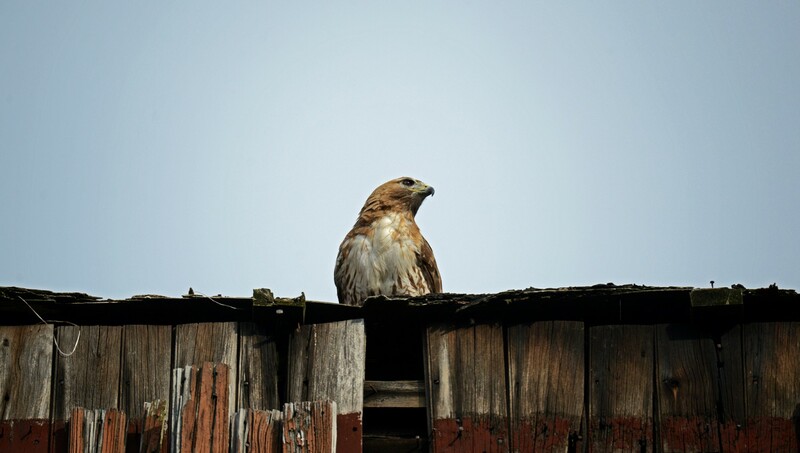 They said it was roosting on a building about a block from Holyoke’s City Hall and a short distance from my apartment, and I should get there soon. By the time I was finally able to take a break and head to the scene, nearly two hours had passed. I was sure the owl would be gone. Instead, I found a large crowd gathered outside the main entrance to the Holyoke Health Center. The bird, a Barred Owl, sat at the edge of a glass awning over the entrance, about 12 feet above the sidewalk. Cars on Maple Street slowed. Bus drivers came to a stop to allow passengers to view the bird. A police officer arrived to try to keep people from spilling over the sidewalk and into the street as they jockeyed for better views. The owl sat quietly, occasionally opening its large eyes and stretching its wings. Jody Spitz of Amherst, a family literacy coordinator at the nearby Picknelly Adult and Family Education Center on Maple Street, was at work when another teacher told her about the owl. “There have been a lot, a lot, a lot of people,” she said of the attention the owl had drawn. Groups of children from a variety of education programs, from the preschoolers of Head Start to the teenagers of the Lower Pioneer Valley Educational Collaborative, had paid visits to observe the bird. After shooting a number of photos, I headed back to the office to finish my workday, figuring I’d seen the last of the owl. As I drove through the intersections of Dwight and High streets on my way home, I could see the reflections of lights from a fire engine on the buildings. I pulled over to see what was happening. A police cruiser blocked access to the block of Maple Street where the owl had been roosting. A fire truck, ladder extended, sat in front of the Health Center, and a large crowd of people stood in the street. I realized I wasn’t at the scene of a fire or a car crash when I saw a man, who turned out to be animal control officer Eric M. Velez of Springfield’s T.J. O’Connor Animal Control and Adoption Center, cradling the owl as he descended the ladder. 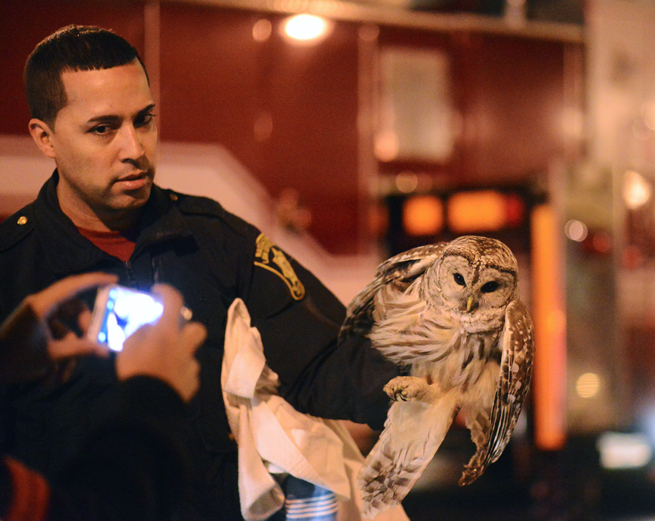 Velez told me that even though the owl showed no obvious signs of injury or trauma, he thought it would be best to take the bird into protective custody for the night. The building has a large glass facade, and there was still a chance the owl had stunned itself in a collision with a window. The fact that the owl hadn’t flown as darkness fell warranted an extra measure of caution. “If he’s still there at one, two o’clock in the morning, who knows what could have happened to him,” Velez told me, noting that there had been a few reports of people harassing the bird over the course of the day. The next morning, the bird would be transferred to local raptor rehabilitator Tom Ricardi for a final checkup before being released to the wild. When you see wildlife in the city — especially a rarely seen specimen like a Barred Owl — it’s easy to jump to the conclusion that the animal’s presence is the product of some mistake or misfortune. Several observers I talked with said they were worried the owl was sick. “Are they supposed to act like this?” at least one person asked me. Technically, I said, yes — owls will roost and rest in one spot for long periods during the day, waiting for dark to head out on their next hunt. There was a decent chance, it seemed, that this owl had come into the city overnight to hunt and settled in its spot on the building as the sun rose. A few weeks later, on the sidewalk outside my apartment, I found the carcass of a dead mouse — one of the Barred Owl’s preferred food sources. I’d never seen a mouse outside in the city before, so I wondered: How many mice have been hiding in plain sight? And, how many owls have been coming into the city to hunt them?